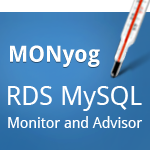 MONyog - RDS MySQL Monitor and Advisor is a 'MySQL DBA in a box' that help you manage MySQL servers. MONyog needs no agents on the servers and hence it is fully cloud ready. Works great with 'Amazon RDS for MySQL' and MySQL servers on 'Amazon EC2'. Agent-less Monitoring: MONyog needs no 'monitoring agents' on the MySQL hosts to be monitored. Hence, a perfect choice for cloud databases like RDS where agents can never be installed. Simple to Deploy: Get up and running in minutes.